The FUZE MS33 series inks are mild solvent inks designed for outdoor and indoor application. They are compatible with all standard substrates available on the market. 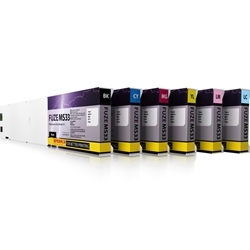 FUZE MS33 ink series are compatible to Mimaki JV3, Mimaki JV33 and Mimaki JV5 respectively and other printers with Epson DX-4, DX-5 and DX-6 print heads. Fuze MS33 are Mix & Match™ with SS-21 inks. Low odor, extremely fast drying time, high scratch resistance, perfect jetability, excellent substrate fixation, excellent light fastness resistance when exposed to outdoor conditions, Mix & Match™ concept ensures chemical compatibility and colors matching to OEM inks.